The long-nosed, hairy mammals are not typically aggressive toward people and are considered a vulnerable species by the International Union for the Conservation of Nature (IUCN), largely due to deforestation and human settlements that encroach on their territory. However, they have poor vision and if frightened, they may defend themselves with front claws that are as long as pocketknives. The case studies of two fatal attacks by giant anteaters were described in the journal Wilderness and Environmental Medicine, which released the paper online this month, ahead of its publication in the December print issue. "Both were farmers, were hunting and were attacked by wounded or cornered animals," lead author Vidal Haddad of the Botucatu School of Medicine at Sao Paulo State University told AFP. 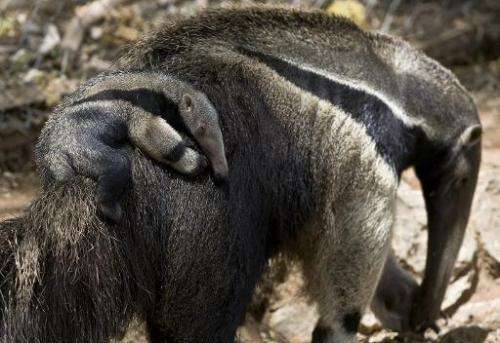 In the first case, a 47-year-old man was hunting with his two sons and his dogs when they came upon a giant anteater in northern Brazil. The hunter did not shoot at the animal, but he approached it with his knife drawn. The anteater stood on its hind legs and grabbed the man with its forelimbs, causing deep puncture wounds in his thighs and upper arms. The hunter bled to death at the scene, said the report, which noted that the encounter happened on August 1, 2012 but had not been described in scientific literature until now. The other case involved a 75-year-old man who died in 2010 when an anteater used its long front claws—which typically help it dig into anthills—to puncture his femoral arteries, located in the groin and thigh. "These injuries are very serious and we have no way of knowing whether it is a defense behavior acquired by the animals," said Haddad. He stressed that such attacks are rare, but said they are important because they show the need for people to give wild animals plenty of space. 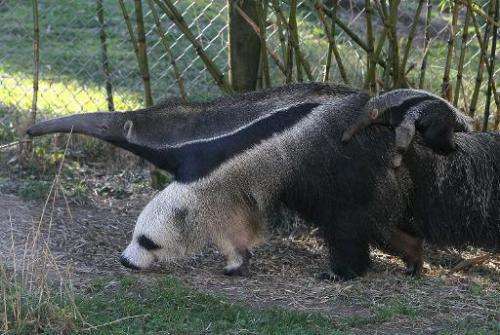 Giant anteaters (Myrmecophaga tridactyla) are believed to be extinct in Belize, El Salvador, Guatemala and Uruguay. Some 5,000 exist in the wild and can be found in parts of Central and South America. Overall their numbers have declined about 30 percent in the past decade due to habitat loss, roadkills, hunting, wildfires and burning of sugar cane plantations, according to the IUCN. They range in length from four to seven feet (1.2-2 meters), and may weigh as much as 100 pounds (45 kilograms). Giant anteaters eat mainly insects but they also enjoy citrus and avocados, according to zookeeper Rebecca Lohse who works with them in captivity at the Reid Park Zoo in Tucson, Arizona. "They are animals that can startle quickly—planes going overheard, chainsaws, leaf blowers can startle them," she said. "The way they defend themselves is by standing up on their rear legs and swinging their front legs in from the side," she explained. "They have incredibly muscular forearms and those claws are several inches long." Zookeepers generally avoid being in the same space as the animals, coaxing them into separate fenced-off areas when they approach their living quarters for cleaning, she added. Anteater expert Flavia Miranda, who works with the animals in Brazil, said she was concerned that the journal article could cause more woes for a creature that already faces plenty of threats to its livelihood. "We have a lot of problems with this species because people believe that (they) bring bad luck and kill the animal on purpose," she told AFP in an email. "But I understand the importance of the article because recently I also had an accident with a giant anteater that almost cost me my life." So, if like Mr. Anchovy, you want to drop chartered accountancy to be a lion tamer, only you've mistaken an anteater for a lion - - - you're still in trouble. I don't know about that guy! I've NEVER run across a wounded animal that gets cornered and DOESN'T fight!!! He was like "Haha, whaddya gonna do lick me to death"?